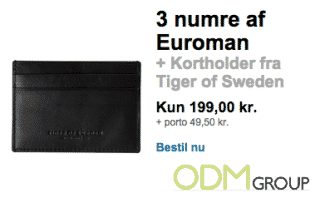 The exclusive Danish Men’s Fashion Magazine, Euroman is now offering a free covermount gift with a purchase of 3 editions of the magazine in order to boost sales. In this purchase you will receive a free cardholder. 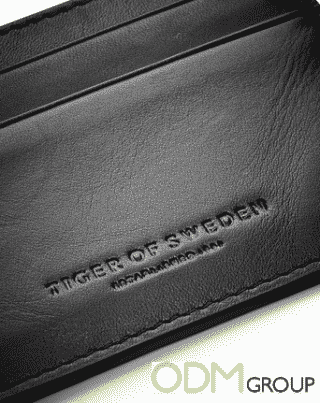 In order to make this offer even more attractive, the magazine is collaborating together with the famous luxury fashion brand, Tiger of Sweden about the gift. ODMasia are a great fan of these covermount gifts promotions, which adds extra value to the product and brand. These kind of on pack promotions is a great way to make people purchase impulse. Before applying the above marketing strategies, you need to consider your brand identity at first. You therefore need to categorise your brand. Is it high-end or low-end? When you did that, you should start consider if your covermount gift is consistent to the quality of your brand. In this case does the above mentioned brands share the same brand existence and are therefore a perfect match for each other. In order to this, people will find the offer more attractive. Covermount gifts are usually packed into the plastic wrap from the magazine. Normally is the gift often designed to the cover of the magazine, which means that this kind of strategy also only will boost sales in the short-run. The bulk-costs of the govermount gift. Do your brand identity relates to the gift? Cost-benefit analysis for the whole campaign.